Agassi’s incredibly rigorous training begins when he is just a child. By the age of thirteen, he is banished to a Florida tennis camp that feels like a prison camp. Lonely, scared, a ninth-grade dropout, he rebels in ways that will soon make him a 1980s icon. He dyes his hair, pierces his ears, dresses like a punk rocker. By the time he turns pro at sixteen, his new look promises to change tennis forever, as does his lightning-fast return. And yet, despite his raw talent, he struggles early on. We feel his confusion as he loses to the world’s best, his greater confusion as he starts to win. After stumbling in three Grand Slam finals, Agassi shocks the world, and himself, by capturing the 1992 Wimbledon. Overnight he becomes a fan favorite and a media target. Agassi brings a near-photographic memory to every pivotal match and every relationship. Never before has the inner game of tennis and the outer game of fame been so precisely limned. Alongside vivid portraits of rivals from several generations—Jimmy Connors, Pete Sampras, Roger Federer—Agassi gives unstinting accounts of his brief time with Barbra Streisand and his doomed marriage to Brooke Shields. He reveals a shattering loss of confidence. And he recounts his spectacular resurrection, a comeback climaxing with his epic run at the 1999 French Open and his march to become the oldest man ever ranked number one. 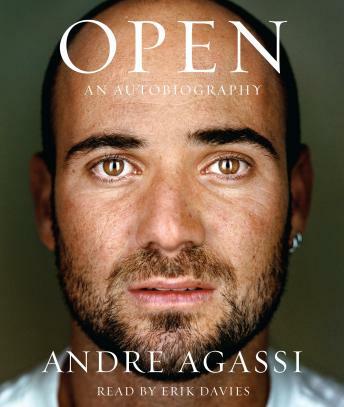 In clear, taut prose, Agassi evokes his loyal brother, his wise coach, his gentle trainer, all the people who help him regain his balance and find love at last with Stefanie Graf. Inspired by her quiet strength, he fights through crippling pain from a deteriorating spine to remain a dangerous opponent in the twenty-first and final year of his career. Entering his last tournament in 2006, he’s hailed for completing a stunning metamorphosis, from nonconformist to elder statesman, from dropout to education advocate. And still he’s not done. At a U.S. Open for the ages, he makes a courageous last stand, then delivers one of the most stirring farewells ever heard in a sporting arena. With its breakneck tempo and raw candor, Open will be read and cherished for years. A treat for ardent fans, it will also captivate readers who know nothing about tennis. Like Agassi’s game, it sets a new standard for grace, style, speed, and power. Very raw and honest..so interesting to hear events I remember described from his point of view. I googled him and caught up with what he is up to 2018. It was so nice to see him still gushing over Stephanie Graf. Gave me a hole new perspective on him over the Rebel image feed to me in the 90’s I was indifferent on him before but now I am a very big fan. Great listen. Listened to this on a very long road trip! Fantastic book! knew very little about andre and enjoyed the book immensely. Fabulous, I've never had such a joy an excitement from an audiobook. Andre Agassi is my hero! I truly enjoyed the book, very well written. I'm not a big tennis fan, but found it to be a very interesting. Highly recommend. Andre has led a very complex life. This book is extremely well written. This book is a find. In present tense from the first paragraph, it conveys an intensity and immediacy that is unparalleled even in the thrilling genre of sports memoirs. Excellent in so many ways! How insane to see this man all over the media and to not have any clue as to who he really is.